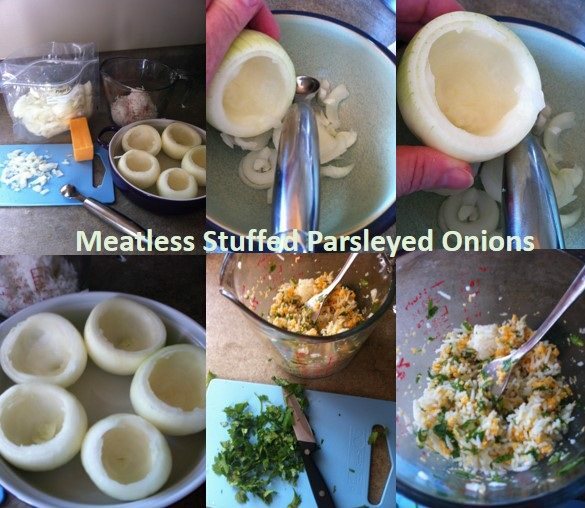 With the holidays around the corner and party invitations on the rise these meatless stuffed parsleyed onions are a perfect side dish or appetizer. If you are going to a potluck or need to bring a dish to a gathering this may be the talk of the table so gather up the simple ingredients and get cooking! 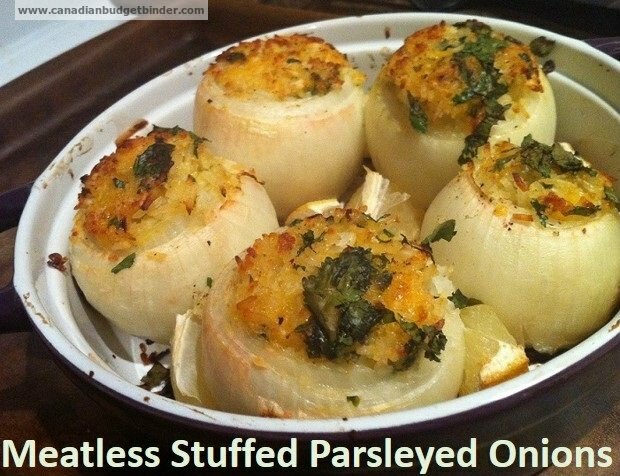 The great thing about these stuffed onions is that they are unique as you don’t see them often on the menu so it will be a lovely treat for your guests. So as part of our girlie night that I talked about last week with you we were asked to bring two dishes along with us, a sweet one which was my Lemon Citrus Syrup Yoghurt Cake and a savory dish which I chose meatless stuffed parsleyed onions. When us ladies have gotten together before we have been left to our own devices and brought more than two dishes and then had more than we could eat so this time we put a limit on what we could bring to combat so many leftovers and potential food waste. Deciding what to take was between a couple of choices for me as I always like to bring something new and exciting for the girls to try along with the tried and true recipes I know they already love. Usually I would take my hubby’s twice baked potatoes skins stuffed with cheese and jalapeno, served with sour cream and guacamole as this is what gets scoffed within a couple of minutes on the table. Since I now have the opportunity for a small gathering with my girlfriends like I mentioned last week I might as well get them to try out my new recipe inventions to see what they think of them. I trust they will give me their honest opinion and tell me whether it’s a hit or a miss. I needed some inspiration so looking in my pantry and my fridge to see what was available on hand to make something different and not too heavy but filling was a bit of a challenge for me. Now I know Mr CBB loves his green stuffed peppers so thinking out of the box I thought why not use onions instead. A light meal which can be used as a starter, part of a main or served with fancy bread! A lot of us like to have a meatless day so why not use this recipe to enhance your veggie options. Now when the stuffed onions were golden brown on top and ready to come out of the oven I finished them off with a garnish of chopped parsley before sending them off to the oven to bake. Peel onions and take the outer skins off. Cut a slice from the top of each onion and scoop out the centre to leave a thick shell. Now I used a melon scoop as it was just the right size to hollow out the onion. Combine all the remaining ingredients, moistening with enough wine to mix well. I often have rice dishes and have leftovers and freeze into bags just for recipes like this. With the scooped out onions I chopped up and froze as well as they can be used in soups, stews and stir-fry’s. Fill the onions with as much as will go. I had some lemons to use up too, so I cut them up into quarters then halved them again placing them in-between the onions. I served the stuffed onions with chunks of Rosemary Focaccia bread topped with a drizzle of extra virgin olive oil and the lemons. My girlfriends then squeezed the lemon over their onion just to give it an extra zing and depth of flavour which to my surprise turned out perfect. 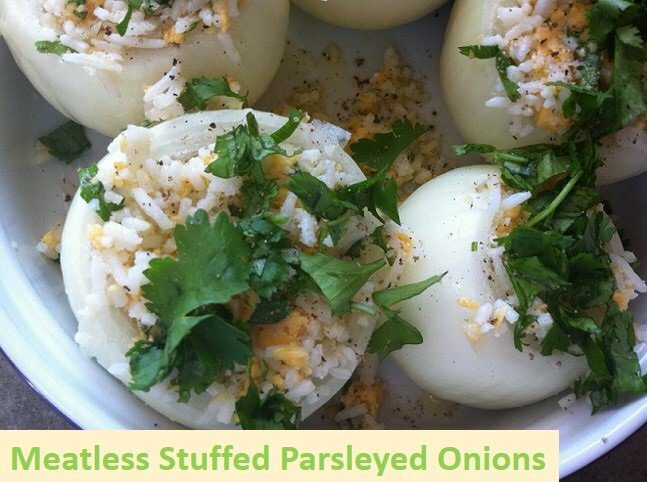 If you are in the mood for a meatless meal and you love onions you won’t fall short with these meatless stuffed parsleyed onions for your meal. They are an affordable meal that won’t break the budget and my girlfriends gave it a thumbs up! 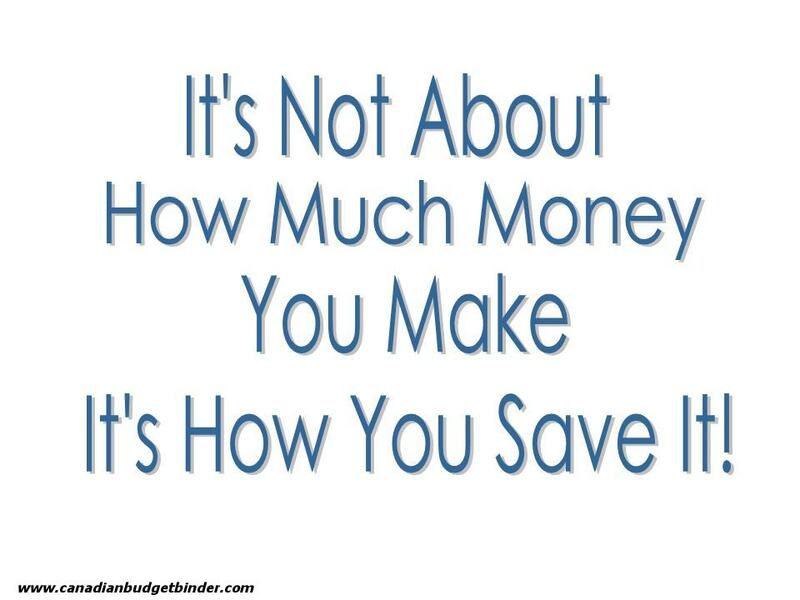 That means I’m a happy girl! I will be using this idea at my Christmas dinner because I can prepare them the day before and cook them on the big day. Big family dinners are so much work for women and I like anything that can be prepared ahead. I will use small onions. When I read the title I thought you were stuffing them with stuffing and I will substitute my stuffing for the rice on Christmas day. Those look delicious. I love stuffed green peppers and one of my favorite dishes as a child was boiled onions and potatoes (just served plain with butter and salt and pepper). I bet you could make those in the crock pot if you’re in a pinch for time. This certainly looks interesting Nicola!!! I’m not that big an onion fan but hubby can be. This is the guy that tried to make onion wine…..once…. Unfortunately the onions he used were rather……potent…shall we say….. It was undrinkable. But he loves his onions. My Mom would have loved this too, she loved her onions!